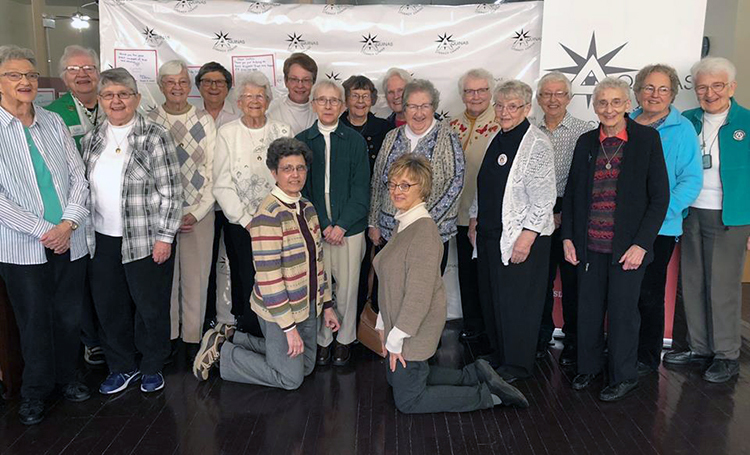 April 3, 2019, Chicago – More than 40 Catholic Sisters and lay people gathered March 13 for a brunch to thank the Sisters for their work at Aquinas Literacy Center. The brunch was in recognition of National Catholic Sisters Week, observed every year March 8-14 to shine a spotlight on the contributions of Catholic Sisters. Nineteen Sisters from six congregations of women religious serve Aquinas Literacy Center as literacy tutors and clerical volunteers, Board members, friends, and benefactors. After the brunch, Sister JoAnn Fleischaker, OP, gave a presentation on the life of St. Dominic and Sister Joan Mary, OP, spoke on the significance of St. Thomas Aquinas, a great Dominican theologian and teacher. The Sisters later shared stories and memories. Aquinas Literacy Center, a nonprofit organization in Chicago’s McKinley Park, is sponsored by the Adrian Dominican Sisters. Aquinas opened in the basement of the convent of Our Lady of Good Counsel Church in1996 under the leadership of Adrian Dominican Sisters Claudia Hinds, OP, and Rosemary Brennan, OP. Now located at 1751 W. 35th Street, Aquinas offers one-on-one tutoring to adult English learners. Those in the Chicago area who are interested in becoming a volunteer English literacy tutor should call 773-927-0512 or email the Volunteer Coordinator at Sabrina@aquinasliteracycenter.org for more information. Sisters who attended Aquinas Literacy Center’s National Catholic Sisters Week Brunch were, back row, from left, Sisters Norine Burns, OP, Lois Dolphin, BVM, Eunice Drazba, OP, Patricia McKee, OP, Jane Zimmerman, OP, Noreen George, OP, Catherine Fedewa, CSFN, Susan Stucki, CSA, Dot Dempsey, OP, Anne Beauvais, OP, Dorothy Glaister, OP, Betty Smith, RSM, Eleanor Smith, OSF, Joan Mary, OP, Patricia Murphy, RSM, Jean Keeley, OP, and JoAnn Fleischaker, OP. Kneeling in front are Sisters Anita Chiappetta, OP, left, and Janice Brown, OP.